Printer was working fine but suddenly printed a whole black page and now won't print at all. It sonds like it's printing as the heads are working etc but no ink is coming through. my printer ran out of ink, I have replaced the ink cartridges but now it wont work at all the lights are flashing green except for the page light and the ink light help please!!! Problem: Printer was working fine but suddenly printed a whole black page and now won't print at all. It sonds like it's printing as the heads are working etc but no ink is coming through. Solution 1: Been using a DX 4850 for about 10 years , had a problem just like yours. unplug everything. Uninstall the CD then reinstall as if it was new. It worked for me. All problems on this page have been submitted and answered by users. 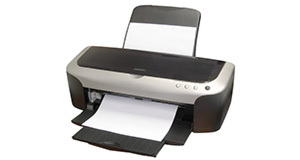 If you have a problem with the Epson DX4850, please submit it below and we'll post it here. Problem: my printer ran out of ink, I have replaced the ink cartridges but now it wont work at all the lights are flashing green except for the page light and the ink light help please!! !